Hannah Pollin-Galay is Senior Lecturer of Yiddish and Holocaust Studies in the Department of Literature at Tel Aviv University and author of Ecologies of Witnessing: Language, Place and Holocaust Testimony (Yale University Press, 2018). She previously worked as a youth educator at Leyvik House, the Union for Yiddish Writers and Journalists in Israel. Can a New Left Movement Shift Israeli Politics? 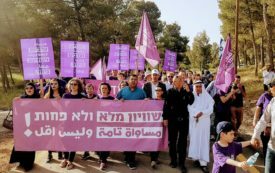 Standing Together is uniting Jewish and Palestinian citizens of Israel in a shared struggle for economic and political justice.